In 1921, McWane (J.R) left and began another new venture, the McWane Cast Iron Pipe Company. As America grew, so did the need to supply flourishing cities with clean water and to remove waste safely. As a result, McWane was able to grow his business. He expanded operations from Birmingham to include a second facility in Provo, Utah, in 1926 called the Pacific States Cast Iron Pipe Company. In 1962, William (Bill) McWane expanded by acquiring Empire Coke Company, a manufacturer of foundry coke and by-products for foundries and other industrial operations. In 1971, James (Jim) Ransom McWane, became president of McWane Cast Iron Pipe Company. During the 1980s, McWane added M&H Valve Company and acquired Clow Water Systems Company and Clow Valve Company. Kennedy Valve Company of Elmira, N.Y., was added in 1988. Subsequently, McWane strengthened its global commitment by establishing McWane International, which markets all McWane products worldwide. In 1995, McWane acquired Tyler Pipe & Coupling in Texas. The company also purchased a couplings operation in California, now known as ANACO. During the late 1990s, McWane acquired the Bibby Companies through Canada Pipe, Tennessee-based Manchester Tank & Equipment Company, Brunner Manufacturing, and Amerex Corporation of Trussville, AL, to the company. The company also owns Manchester Tankand Equipment in Australia. In 2008, Janus Fire Systems, based out of Crown Point, IN, joined McWane as a division of Amerex.. Janus is dedicated to becoming the leader in the fire suppression special hazard industry. Then, in 2012, McWane began their diversification strategy into technology by adding Synapse Wireless to their portfolio of companies. Additional technology additions to McWane include ComTech Korea, a mobile communications service provider based in Seoul, Futurecom, an Ontario-based RF coverage extension solutions, and Nighthawk, a leading provider for wireless smart grid solutions. In 2014, McWane acquired UK-based Zinwave, a global company which has pioneer a new approach for reliable multi-service in-building wireless coverage. McWane Gulf was established in 2015 for expanding the production and sales of our fittings, valve, hydrant, and plumbing products into Middle East markets. 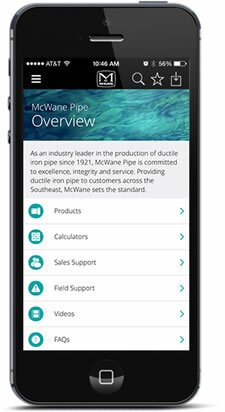 .McWane Gulf will produce water and sewer products to international specifications, including ductile iron fittings, valves and hydrants, drainage products, soil pipe along with fittings and couplings. Today, McWane, Inc. is led by Chairman Phillip McWane and one of the largest privately owned companies in the southeastern USA.